Not my best photo, but the winter isn't giving me much light to work with! I just finished some little turtle coasters. My first coasters ever. It was hard to part with even the tiny squares of my turtle fabric. I just love that print. I don't know who makes it, but you can find it at several places that carry Japanese import fabrics. I chose a plain patterned back side so that I could quilt meandering lines between the turtles on the front. If there were turtles on both sides, one side would have had quilting through the turtle's bodies and I didn't want that. I cut eight 4" squares of cotton batting that I had preshrunk. I also clipped the corners off of them so they would fit nice inside the coasters. I stitched around the coasters with a 1/4" seam allowance, leaving about a 3" opening in the middle of one of the sides. I then turned them right side out through the opening. I folded the edges of the opening to the inside and stitched around the coasters (probably about 1/8" from the edge), closing up the open side in the process. 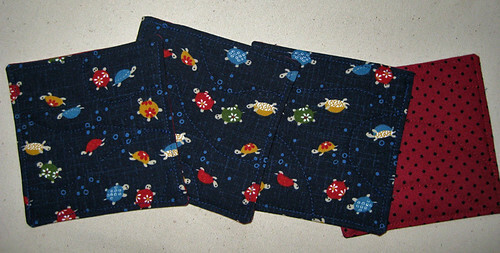 Then, I sewed meandering lines between the turtles to quilt the coasters and hold the batting in place. I was careful not to stitch over border I already sewed in step #3 to keep them looking nice. That's it, they're ready to give to a good home! *I bought my turtle fabric at crafty planet.